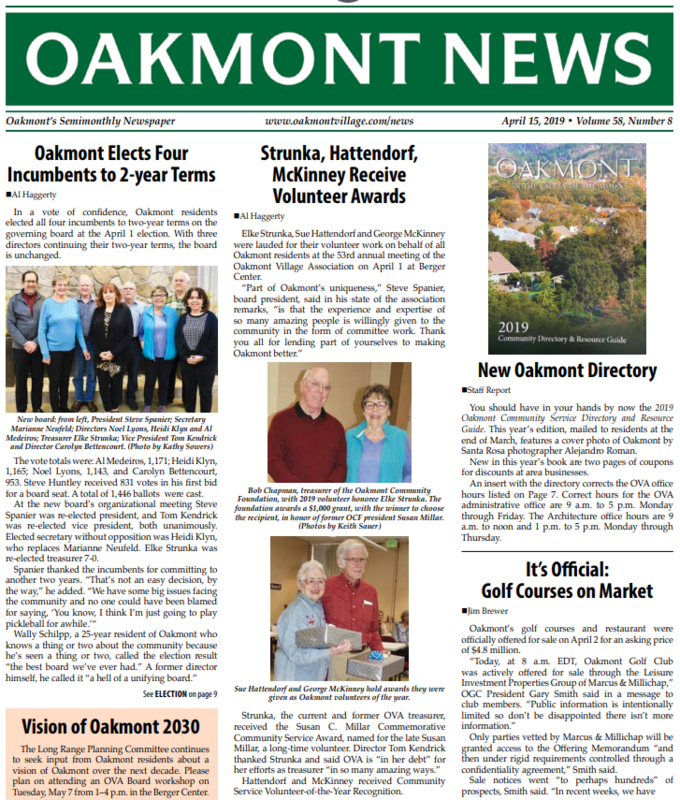 The Oakmont Village Association will accept credit cards to pay for facility access cards and other miscellaneous fees. Cards will be accepted as soon as the card reader is installed, expected by May 1. The new policy, approved unanimously at the March 19 board meeting, is aimed at keeping cash transactions handled in the OVA office to a minimum for the purpose of internal control. Umpqua Bank will provide the service with a countertop card reader. The total cost is $255 plus tax and shipping for the reader and $19.95 a month plus 10 cents per transaction. Over the last six months, the office has handled 295 transactions, 143 by cash and 152 by check. Jane Gyorgy, who helped set up the new organization, said a training class will be held from noon to 4 p.m. April 5 at the East Recreation Center to familiarize operators with the new AV equipment at the remodeled recreation center. The board approved permanently leasing Suite B at 6637 Oakmont Dr., which it began leasing March 1, 2018, when 22 clubs were displaced from the East Rec Center during construction. Manager Kevin Hubred recommended the move to help accommodate the number of Oakmont clubs and groups, which has grown to number 146. Measuring approximately 830 square feet, it will accommodate 36 to 40 people. The cost is $1,500 a month plus $100 to $200 a month for utilities. The lease is month-to-month with a 60-day termination notice. Hubred said OVA has submitted a request for a $1,920,000 CalFire grant. He said the grant will be approved for the full amount or not at all. The funds would cover fire prevention efforts throughout Oakmont (removal and trimming of trees, junipers and other fuels), community outreach, hiring a project manager, paying for staff time working on the project, collaboration with Sonoma Ecology Center for future projects and planning for future fire prevention plans. Hubred said CalFire will contact recipients in April. If awarded, funds will be available in September, which will give OVA four to five months to submit the required paperwork that must be filed before funds are available. The next regular board meeting will be held at 1 p.m. Tuesday, April 16 at Berger Center.